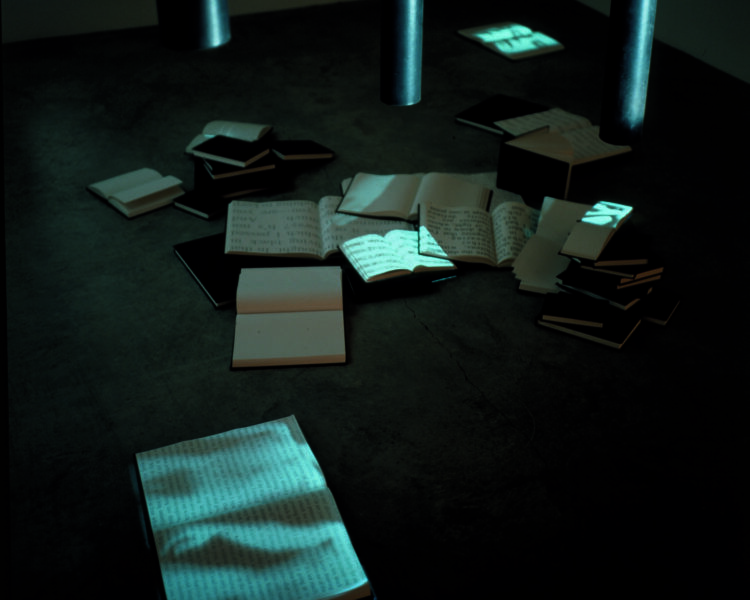 I Believe It Is an Image in Light of the Other consists of seven cylindrical tubes, each containing a modified 4-inch black-and-white monitor and lens, which are suspended from the ceiling at varying heights above a grouping of books. 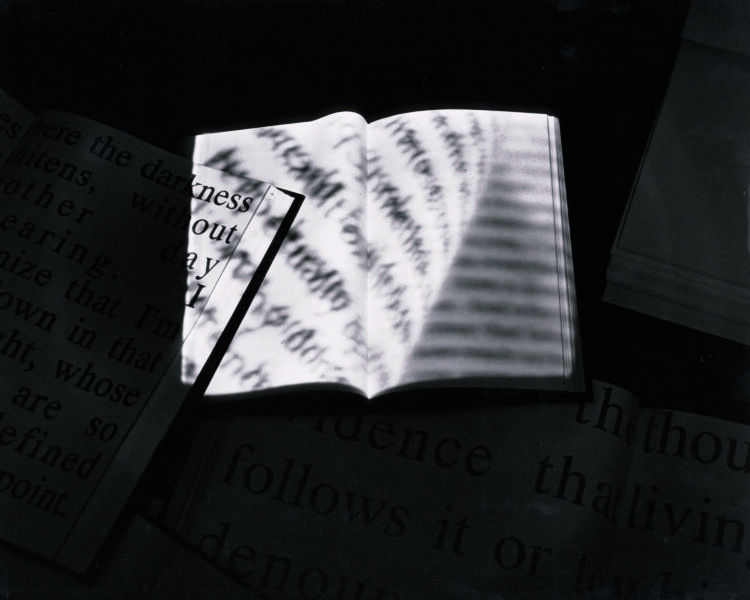 The only source of light is from the projected images, visible on the books’ open pages. 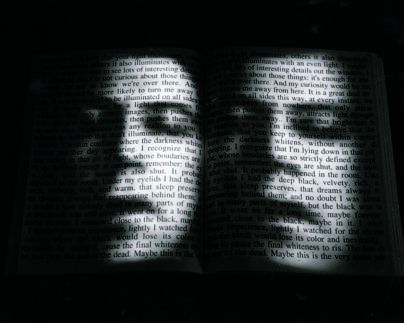 The images vary in size corresponding to different sized books and consist of a double face, double torso, double body, mouth and fingers, projected text, hands, and a chair. 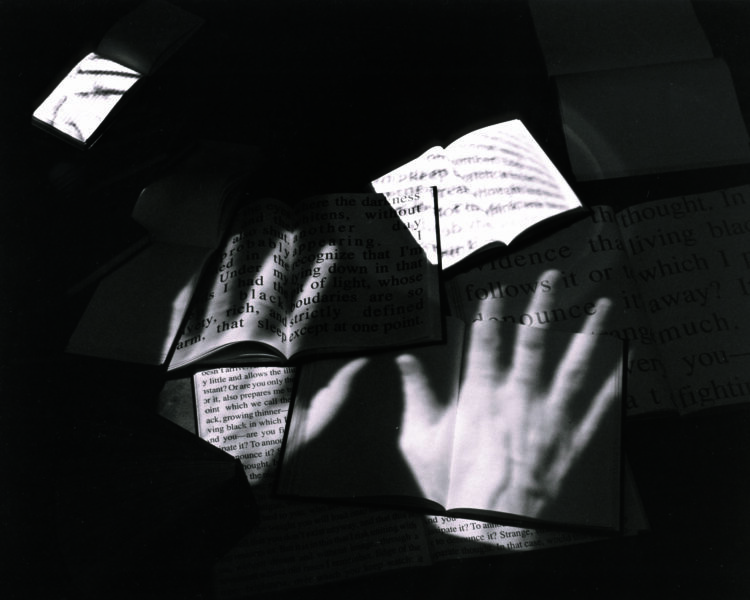 The video-illuminated texts on the books’ pages, which either end abruptly with the edges of the page or become lost in the bind, are comprised of excerpts from Maurice Blanchot’s The Last Man. The movement of the body and the double images play with the formal space and construction of books. Large hands in the middle move slowly and deliberately, making a clearing motion and generating the only sound one hears—a dull rubbing of the surface. An example of this work was exhibited for the first time at the Donald Young Gallery, Seattle, Washington, January 17 – April 8, 1992. Solo exhibition. Stedelijk Van Abbemuseum, Eindhoven, The Netherlands, December 5, 1992 – January 31, 1993. “Performing Objects,” Institute of Contemporary Art, Boston, Massachusetts, December 9, 1992 – February 21, 1993. “Gary Hill,” (travelling exhibition organized by the Henry Art Gallery, University of Washington, Seattle, Washington), Hirshhorn Museum and Sculpture Garden, Washington, D.C., February 17 – May 8, 1994; Museum of Contemporary, Chicago, Illinois, September 24 – November 27, 1994; Guggenheim Museum SoHo, New York, New York, May 11 – August 20, 1995; Kemper Museum of Contemporary Art and Design, Kansas City, Missouri, October 14, 1995 – January 14, 1996. “Gary Hill,” (travelling exhibition organized by the Riksutställningar, Stockholm, Sweden), Moderna Museet, Spårvagnshallarna, Stockholm, Sweden, February 4 – April 17, 1995. “D’Ombra,” Palazzo delle Papesse Centro arte Contemporanea, Siena, Italy; October 14, 2006 – January 7, 2007. Travelled to: MAN, Museo d’Arte della Provincia di Nuovo, Italy. January – April 2007; Compton Verney, Warwickshire, England, June 30 – September 9, 2007. Gary Hill, Video Installations. Program notes. Eindhoven: Stedelijk Van Abbemuseum, 1992, unpaginated. Sarrazin, Stephen. Chimaera Monographe No. 10 (Gary Hill). Montbéliard, France: Centre International de Création Vidéo Montbéliard, Belfort, 1992, pp. 8, 44, 45, 61, 82. (Including excerpts from a preface by Gary Hill and an interview with Gary Hill). Van Assche, Christine. Gary Hill. Paris: Editions du Centre Georges Pompidou, 1992, pp. 6, 12, 29, 39, 79 – 81, 83 – 85, 87. (Including an excerpt from Gary Hill, “Inter-view”). Documenta IX. 3 volumes. Stuttgart: Edition Cantz; New York: H. N. Abrams, 1992, vol. 2, pp. 222 – 225, 308. Cooke, Lynne. "Gary Hill: 'Who am I but a figure of speech?'" Parkett 34 (1992), pp. 17, 18. Smallwood, Lyn. "The World as They Know It." Seattle Weekly (March 18, 1992), p. 28. Mittenthal, Robert. "Overpowering Ideas." Reflex (March/April 1992), pp. 19, 20. Gary Hill: In Light of the Other. Oxford: Museum of Modern Art Oxford; Liverpool: The Tate Gallery Liverpool, 1993, pp. 5, 7, 9, 16 – 21. Mignot, Dorine. Gary Hill. Amsterdam: Stedelijk Museum; Vienna: Kunsthalle Wien, 1993, pp. 16, 19, 41 – 46, 49. (Including an excerpt from Gary Hill, “Inter-view”). Van Assche, Christine and Corinne Diserens. Gary Hill. Valencia: Instituto Valenciano de Arte Moderno (IVAM), Centre del Carme, 1993, pp. 10, 16, 33, 43, 83 – 85, 87 – 89, 91, 130, 131, 145. (Including an excerpt from Gary Hill, “Inter-view”). Sorensen, Jens Erik, ed. Strange Hotel International Art. Aarhus: Aarhus Kunstmuseum, 1993, pp. 83, 121, 122. Aanwinsten 1989 – 1993: een selectie. Eindhoven: Stedelijk Van Abbemuseum, 1993, pp. 36 – 39. Von Graevenitz, Antje. "Living Funeral Art--Video Installations by Bill Viola and Gary Hill." Archis (July 1993), pp. 47, 50, 51. Den Hartog Jager, Hans. “Droomwereld.” HP de Tijd (September 3, 1993), p. 113. De Rijcke, Elke. “Dageraad of avondschemer over de video-installaties van Gary Hill.” Metropolis M 1 (1993), pp. 26 - 30. Bruce, Chris. Gary Hill. Seattle, Washington: Henry Art Gallery, University of Washington, 1994, pp. 15, 17, 18, 21 – 23, 83. Willis, Holly, ed. Gary Hill. Spinning the Spur of the Moment. Irvington, New York: The Voyager Company, 1994, pp. 8, 9. Vogel, Sabine B. “Im Licht des Monitors Gary Hill.” Artis (December 1994/January 1995), p. 46. Nagy, Pál. Az irodalom úm mufajai. Budapest: Magyar Muhely, 1995, p. 333. Meyers, Todd. “Consciousness and Fragmentation. Gary Hill Encountering Bodies.” Fuse Magazine 18, 3 (Spring 1995), p. 46. Taubin, Amy. “Video: Gary Hill.” Village Voice 11, 21 (May 17 - 23, 1995), p. 3. Duncan, Michael. “In Plato’s electronic cave.” Art in America 83, 6 (June 1995), p. 71. Young, Lisa Jaye. “Electronic Verses: Reading the Body vs. Touching the Text,” Performing Arts Journal 52, 18, 1 (January 1996), pp. 38, 40. Suchère, Eric. “Gary Hill Le Trafiquant d’ Images.” Beaux Arts 142 (February 1996), pp. 68, 69. Dantas, Marcello. Gary Hill: O lugar do outro/where the other takes place. Rio de Janeiro: Magnetoscópio, 1997, pp. 36, 50. Marcoci, Roxana, Diana Murphy, and Eve Sinaiko, eds. New Art. New York: Harry N. Abrams, 1997, p. 66. Quasha, George and Charles Stein. Viewer. Gary Hill’s Projective Installations 3. Barrytown, New York: Station Hill Arts, 1997, pp. 9, 68 – 70, 77. Do, Willo. “Overseas Artist: Interview with Gary Hill.” Space, Japan (April 1997), p. 84. Schneider, Irmela. “Wörter sehen und Bilder lesen. Einige Betrachtungen zur Veränderung von Grundlagen innerhalb der Medienästhetik. Soziale Wirklichkeit, Jena, Germany (Winter 1997), pp. 312 – 314. Der elektronische Raum: 15 Positionen zur Medienkunst. Bonn: Kunst- und Ausstellungshalle der Bundesrepublik Dueuschland, 1998, pp. 148, 151. Gamwell, Lynn, ed. Dreams 1900 – 2000: Science, Art, and the Unconscious Mind. Ithaca, New York: Cornell University Press; Binghamton, New York: Binghamton University Art Museum, State University of New York, 2000, pp. 49, 50, 240. Morgan, Robert C., ed. Gary Hill. Baltimore: PAJ Books / The Johns Hopkins University Press, 2000, pp. 8, 87, 88, 147, 154, 221, 296. Gary Hill: Instalaciones. Córdoba: Ediciones Museo Caraffa, 2000, pp. 14, 20, 32. Quasha, George and Charles Stein. La performance elle-même in Gary Hill: Around & About: A Performative View. Paris: Éditions du Regard, 2001, pp. 14 - 20. Mauron, Véronique. Le signe incarné: ombres et reflets dans l’art contemporain. Paris: Éditions Hazan, 2001, p. 257. Pytlinski, Deanne. “Liminality and Ritual in the Art of Gary Hill.” Chicago Art Journal 11 (Spring 2001), pp. 65 - 66. Riemschneider, Burkhard and Uta Grosenick, eds. Art Now. Cologne: Taschen, 2001, pp. 69. Acquisitions 1992 – 2001. Rochechouart: Musée Départemental d’art Contemporain de Rochechouart, 2001, pp. 9, 56 – 57, 120. L’image au collège. Paris: Éditions Belin, 2002, p. 72. Gary Hill: Selected Works and catalogue raisonné. Wolfsburg: Kunstmuseum Wolfsburg, 2002, GHCR 71, pp. 24, 30, 140, 157 –159, 248. Barro, David. Gary Hill: Poeta da percepção, poet of perception, poeta de la percepción. In Portuguese, Spanish and English. Porto: Mimesis, 2003, pp. 15, 37, 42 – 43, 59, cover. Shaw, Jeffrey and Peter Weibel. Future Cinema: The Cinematic Imaginary after Film. Karlsruhe: ZKM and Cambridge: MIT Press, 2003, pp. 306 - 307. Blocker, Jane. What the Body Cost: Desire, History and Performance. (Minneapolis: University of Minnesota Press, 2004), pp. 36 – 39. Samaniego, Alberto Ruiz de. “Gary Hill and Maurice Blanchot: Dialogues at the Threshold.” Dardo 2 (June – September 2006), pp. 146 – 179. Vergine, Lea. D’Ombra. Milan: Silvana Editorale Spa, 2006, pp. 30, 49, 60, 118, 147 – 149. Odin, Paul-Emmanuel. L’absence de livre [Gary Hill et Maurice Blanchot – Écriture, vidéo]. Marseille: La Compagnie, 2007, pp. 259, 266, 286. Quasha, George and Charles Stein. An Art of Limina:Gary Hill’s Works and Writings. Barcelona: Ediciones Polígrafa, 2009, pp. 16, 19, 60, 264, 275, 459, 561, 581. The written texts are fragments from The Last Man, 1957, by Maurice Blanchot (translated by Lydia Davis, New York: Columbia University Press, 1987).